(I)t concerns the salvation of all men, that the infancy of the Mediator between God and men was already being declared to the whole world, while it was yet confined within a small village. For although He had chosen the people of Israel, and of that people, a single family, whence He might take upon Himself the nature of all mankind; nevertheless He did not want the first dawn of His rising to lie hidden within the narrow walls of His Mother’s abode; but rather, He wished to be acknowledged at once by all, He who deigned to be born for all. 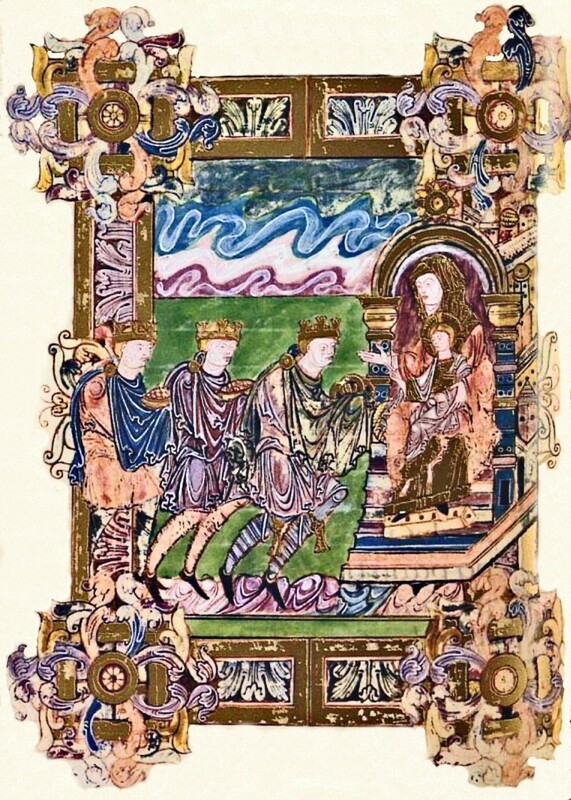 Despite the varying quality of early Christian images, from roughly scratched inscriptions on funerary stones to elaborate sarcophagi and frescoes, nearly all early images of the Magi show them moving towards Christ, as he sits in the lap of the enthroned Virgin; this also represents the calling of all of the nations of the earth to conversion and redemption. 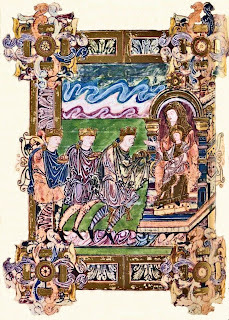 In the rougher sorts of images, such as the one shown above, with the general lack of detail, the three Magi are not distinguished from one another, although their offerings are. 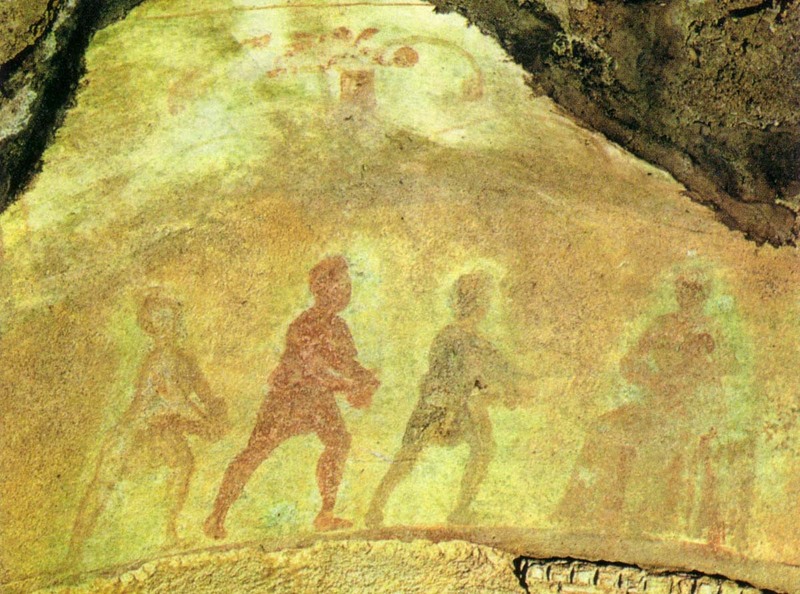 In the Catacomb of Priscilla, however, one of the frescoes shows each of the three in a different color, one from each of the three parts of the world. 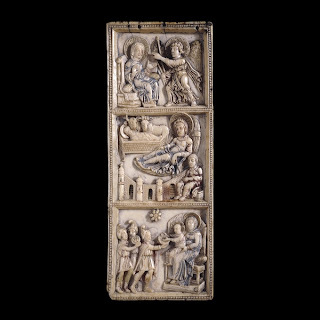 This image of the third-century is especially important because it is in the funeral chapel of a very wealthy family; the many paintings within it were of a very high quality, though they have deteriorated greatly over the centuries. It is safe to say, therefore, that they were conceived among the most educated Christians, and it is not surprising to find artistic ideas born in such an environment flourishing in the great churches built in early centuries after the end of the persecutions. from Psalm 28: Bring to the Lord, O ye children of God: adore ye the Lord in his holy court. from Psalm 65: Let all the earth adore thee, and sing to thee: let it sing a psalm to thy name, o Lord. from Psalm 85: All the nations thou hast made shall come, and adore before thee, O Lord. A relief from a sarcophagus of the 4th century, originally in the Catacomb of St. Agnes, now in the Vatican Museums. In the Roman world, many kinds of sculpture were originally painted, although the paints have worn off over the centuries. It possible that the Three Magi paint were originally distinguished from each other in this way, as they are above in the fresco; note that they are holding three different gifts. In the sixth century, a new element is introduced, that of the Three Ages of Man, a concept derived from Aristotle. 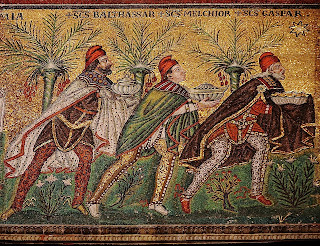 (Rhetoric II.12) In the 6th-century mosaics of Sant’Apollinare Nuovo in Ravenna, the Magi are represented one as a youth, one as a adult, one as an elderly man. Here, the idea of the universality of Christ’s salvation is expanded to refer not only to all nations, but all aspects of humanity. For the same reason, the Magi are leading a procession of 22 sainted virgins towards the Madonna and Child, while 26 male saints are shown coming towards an adult Christ on the opposite side of the church. 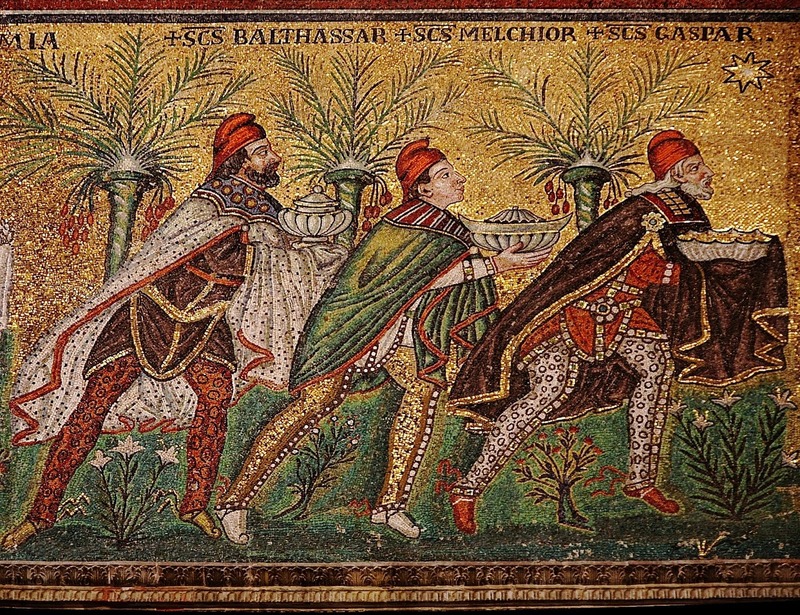 In all of these images, the Magi are shown wearing the clothes of “barbarians”, i.e., non-Romans, the Phrygian cap, and elaborately decorated garments with pants and sleeves, instead of the looser and simpler Roman togas. 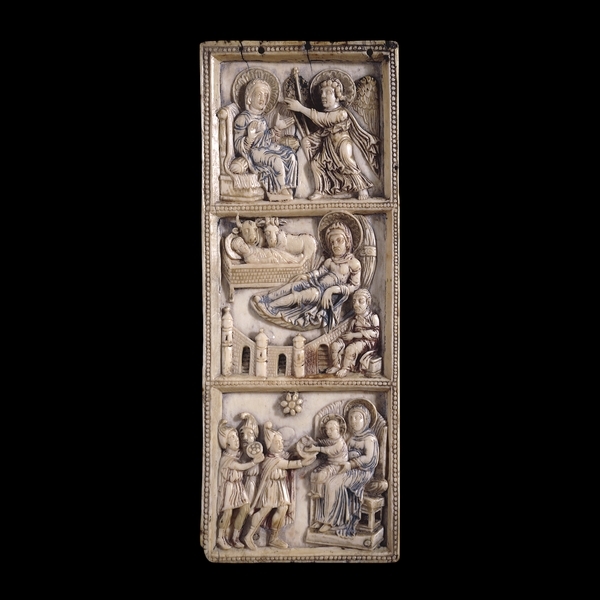 This tradition continues into the Carolingian period, as seen here in the lowest part this ivory panel from the British Museum. 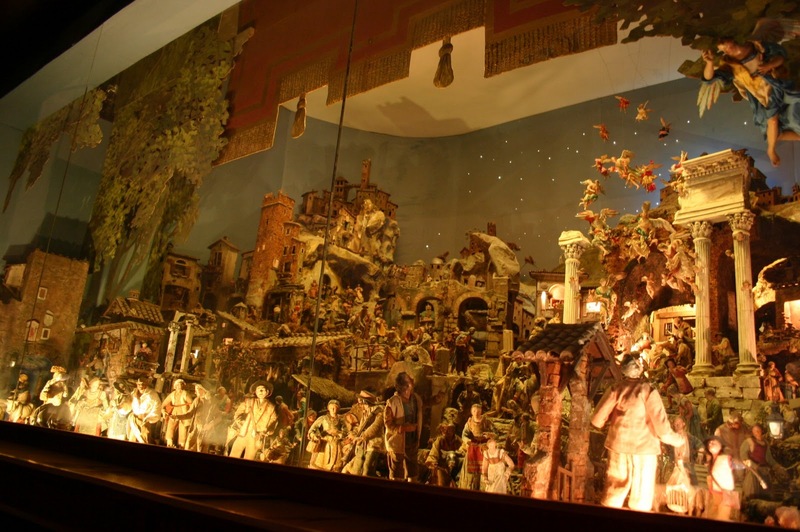 The later part of the fifteenth century saw the emergence of a new motif, the placement of the Nativity scene amid the ruins of a large building, or with a ruined building in the background. On a purely technical level, this reflects the interest of Renaissance artists in Roman antiquities, as part of the general revival of Roman learning and art. Theologically, the ruins also represent the world, which Christ came to renew, as He says in the Apocalypse, “Behold, I make all things new.” The artists of the period thus associated their renewal of the intellectual and artistic achievements of the Classical world with what Christ did for the whole human race in the Incarnation. 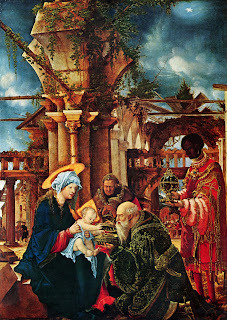 The Adoration of the Magi, by Albrecht Altdorfer, ca. 1530. 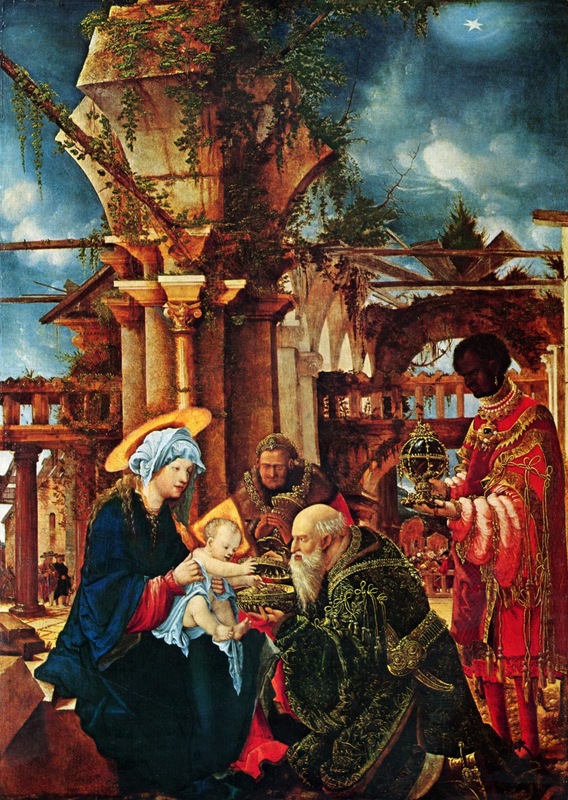 Note the confluence of the various traditions discussed above - the three Kings, the three Ages of Man, the very elaborate clothes, and the ruined building. The European and Asian Magi are not distinguished from each other as clearly as they are from the African; people of African origin were known to Europeans throughout history, but a 16th century German would not be likely to have ever seen an Asian. A traditional Neapolitan Nativity scene of the 18th century, now on permanent display at the Roman church of Saints Cosmas and Damian. The ruins visible on the right side are the Column of Phocas and the Temple of Saturn, both in the Roman Forum, barely 200 meters from the ancient entrance to the church. The panoply of human activity of every kind represents the sanctification of all of human life and endeavor by the union of God and man in Christ. The Holy Family within the ruins of a Roman building, part of the Nativity scene of the Augustinian church of St. Maurice in Fribourg, Switzerland. The chapel in the background is a representation of a real chapel dedicated to Our Lady of Loreto, which sits on a cliff and can be seen from most of the lower part of the city; the Nativity is thus presented to the viewers as if it were taking place in their own parish church.